One afternoon, my husband, son, grandson and I enjoyed our lunch at The Casa Tua Mediterranee restaurant located in the Palm Beach Plaza Mall. It is directly across from the Mega Plex Cinema on the 2nd floor. This restaurant offers you a delicious blend of Mediterranean flavors. We chose to be seated indoors to enjoy the air conditioned restaurant while others sat on the outside terrace. It is a very clean and friendly atmosphere that includes modern dark wood furniture, a bar, and a comfortable lounge area. 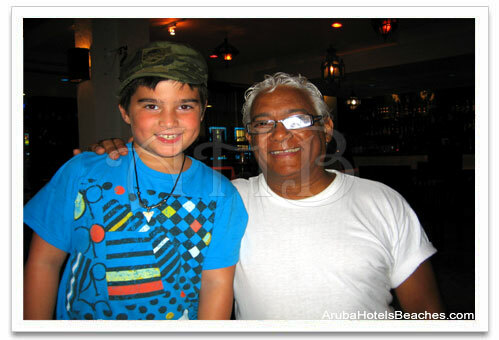 This photo shows our grandson, CJ, with our new friend Oscar. Not only was Oscar friendly and fun but he made great suggestions and was quick to serve us with a wonderful lunch. We thoroughly enjoyed the delicious Spanacopitakia, which is Greek fried filo pastry triangles stuffed with spinach and cheese, a traditional Caesar salad, and the best thin crust Margherita pizza with pepperoni on the island! 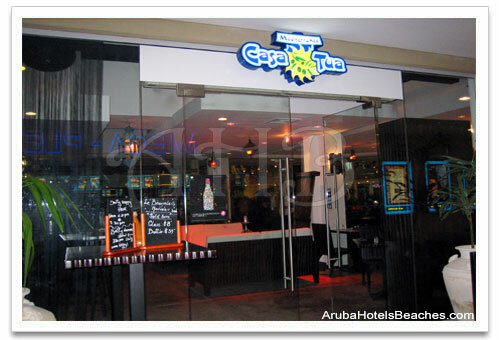 We hear this restaurant also features belly dancers for your entertainment a few nights a week, 8pm -10pm. We thank Oscar and the rest of the Casa Tua Mediterranee staff for a great lunch and friendly service. We definitely will be back. Click here for the Casa Tua Mediterranee website. 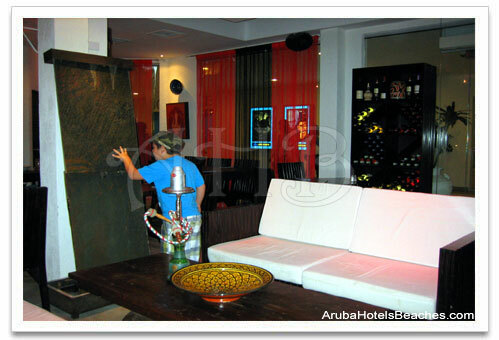 Click here to return to our Aruba Restaurants page.